My food cravings can lead me on some interesting adventures. Just ask my hubby! Once I crave something, there’s no turning it off. I may have to postpone it sometimes due to leftovers that have to be consumed or created, but after that I am on a mission. 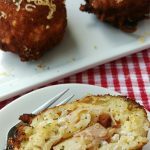 Last week I was craving chicken cordon bleu (there’s no rhyme or reason for my cravings). 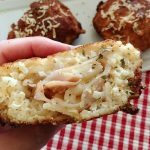 When I make chicken cordon bleu, I go to the deli counter to buy just the right amount of ham and cheese needed to make dinner. Last week, however, was back to school, so that meant the deli line was way too long for me. (Little known fact, I hate waiting in lines. Well, some lines, I have been known to gladly stand in line for two hours to ride a roller coaster!) The line dilemma forced me to buy whole packages of ham and cheese which I found out yesterday was a very tasty thing. Hint: It involves spaghetti and cheese! Spaghetti Carbonara, the silky smooth pasta with eggs, cheese, and pancetta or bacon, is something I never get to make in our house with my egg hating hubby…until now. (But shhh let’s keep quiet on the egg bath!) My Fried Spaghetti Carbonara Balls, of course, have leftover ham and cheese, but the secret to its creaminess lies in the ricotta cheese. See look at the creaminess and they haven’t even been coated and fried yet. Mix together spaghetti, ricotta cheese, pepper, and garlic powder. 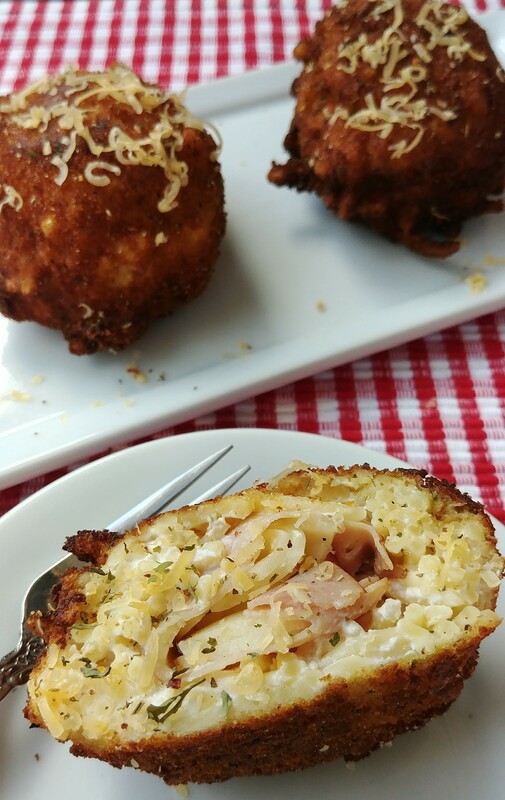 Roll up each slice of ham and cheese into a ball. 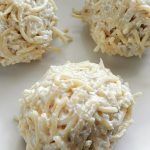 Using wet hands, mold the spaghetti mixture around the ham and cheese balls. Set in refrigerator for 30 minutes. Put flour, egg, and bread crumbs in three separate bowls. Dredge spaghetti balls in flour, shaking off excess. Dip in egg, letting excess drip off, then dredge in bread crumbs. Set on wax paper lined plate. Repeat with remaining balls. Refrigerate 30 minutes. Heat oil to 360*. Using a slotted spoon, lower spaghetti balls into oil, fry, turning occasionally, until golden brown, about 1 1/2 to 2 minutes. Transfer with slotted spoon to paper towels to drain. Let stand 5 minutes. Can be served with Alfredo or tomato sauce.